How do I navigate campus? Student tours at orientation and the campus tours led by Rambassadors give a comprehensive look at what the campus looks like, so I would recommend attending at least one of these so that you can begin to familiarize yourself with campus buildings. However, it’s easy to forget where some buildings, are especially after only one tour, so it certainly helps to download a map of the campus and have it handy just in case you lose your bearings on campus. Don’t feel embarrassed to use your personal campus map or refer to one of the campus maps at designated spots. We’ve all been there at some point! Where do I get my student ID? Getting your student ID is a quick and easy process and not as daunting as you think it would be. In order to get your student ID you simply go to University Police (refer to your campus map if you need to locate University Police) with your student detail schedule and a form of ID, and they will take your ID picture. It’s important to know that you don’t get your student ID immediately, and it takes approximately two weeks before you can collect it, so be sure to go to University Police before the semester begins, as it is mandatory to have your campus ID with you whenever you are on campus. Parking passes are a necessity if you are a commuter student or plan to bring your car with you to campus as a resident student. As a commuter student you must purchase parking permits for $30, using this link: https://farmingdale.t2hosted.com/Account/Portal. But if you are a resident student, you simply walk into University Police to purchase your parking permit. Your parking permits must be visibly displayed on your vehicle to ensure you don’t get ticketed. FSC has a range of meal plans to choose from so that you never have to feel hungry during or between your classes. As a resident student it is required that you have a Carte Blanche or a Carte Blanche Premium meal plan. These meal plans include three guest pass swipes that you can use on a family member or friend that you would like to dine with at Pop’s Dining. Commuter students, on the other hand, do not have to have one of these meal plans, as it is optional. However, whether you are a commuter or a resident you can add a Declining Balance or DB to your student ID, which can be used at any of the campus dining areas. Academic advising at Academic Advisement and Information Center – or AAIC – is one of the most important things you need to do before the new semester. The AAIC advisors help you through your time at college by mapping out your classes for each semester and ensuring that all the credit requirements needed to graduate are fulfilled. The advisors are extremely helpful and use their expertise to help ensure that each semester’s workload is manageable. You can make an academic appointment using the following link: https://www.farmingdale.edu/academics/academic-advisement/academic-advisement-information-center/schedule-appointment.shtml. RamCentral and the Campus Times. You will definitely hear about RamCentral and the Campus Times at some point during your time at FSC, but sooner is better than later, as these resources provide lots of useful information about campus activities and makes important announcements about campus life, such as employment opportunities and upcoming events. They can both be accessed through the school’s website, but for RamCentral you will need to use your Oasis login to gain entrance. Making friends at college is a bit different from high school, especially on a commuter campus, as most people simply go to classes and then leave for work or home, leaving little time to socialize with the members of their campus community. But having college friends can enhance your university experience. Some of the best spots on campus to make friends on campus are the Campus Center and Conklin Hall, as these spots are where students usually spend their free time during the breaks between their classes. The lower level of Conklin Hall is particularly fun, as it’s a great area to hang out and play games with new people. Your student ID gives you lots of perks and student discounts. 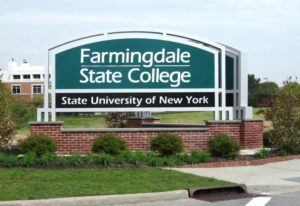 FSC has ties with numerous business in and around the vicinity of Farmingdale that give students at FSC great deals and discounts. As a college student every penny counts, so shopping at the participating Ram Rewards vendors can really help you save some cash where it matters.